The most recent Monthly Revenue Focus from the Department of Administrative Services for FY 2016 was encouraging. Through the first two months of the current fiscal year, total General and Education Fund revenue is 6.6 percent higher than what was collected in the same two months of the last fiscal year. For context, revenue estimates by the Governor, House, Senate, and Committee of Conference forecasted revenues to grow anywhere from 1.5 to 2.5 percent in FY 2016. Given that the state has collected only about 10 percent of what it will eventually receive, it’s still too soon to draw substantive conclusions. Nevertheless, revenue collections appear to be exceeding projections by the Committee of Conference. The following data visualization is designed to help you understand these latest data. Within each tab, you can hover over each data point to view additional context. On the right side are seven radio buttons, which allow you to further investigate revenue trends by specific tax type or by total collections. Compared to a monthly revenue plan estimated by NHFPI, state revenues are slightly ahead of Committee of Conference revenue projections. As mentioned in a previous post, each fiscal year the Department of Administrative Services creates a monthly revenue “plan” to help compare actual revenue collections with what was projected by legislators and affirmed by the Governor during the crafting of the state budget. However, it is unlikely that this monthly allocation will be produced until the state enacts a budget for the FY 2016 – FY 2017 biennium. Thus, NHFPI has attempted to formulate what such a plan might look like based on the Committee of Conference projections. Below is a table with our estimates for total General and Education Fund revenues as well as some of the major revenue streams for the state on a month-by-month basis for FY 2016. To view how we arrived at these figures, please review for our methodology. 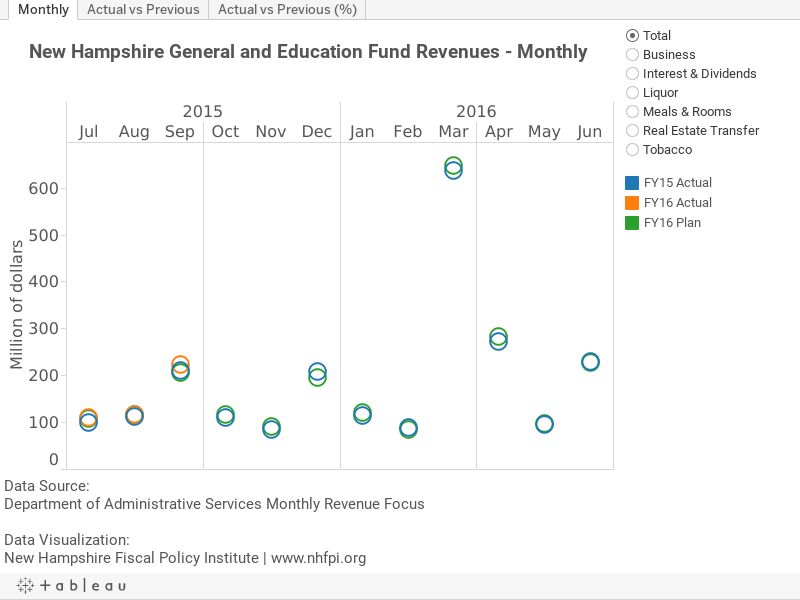 Using the Committee of Conference FY 2016 projections for General and Education Fund revenue, NHFPI estimates that through July and August the state should have received about $223 million. So far, the state has received $225 million, $2 million or 1 percent above expectations. Most of the positive news stems from the real estate transfer tax performing exceptionally well. Although July and August are not important months for most state revenue streams, the real estate transfer tax is one of the exceptions. July and August real estate transfer tax collections comprise about 20 percent of what the tax will eventually yield for the entire fiscal year compared to 9.7 percent for overall General and Education Fund revenues. This is due to the fact that real estate activity in New Hampshire is seasonal, usually peaking in the summer months and hitting a bottom during the dead of winter. Through the first two months of FY 2016, the tax has brought $29.7 million in to state coffers, $7.5 million or nearly 34 percent higher than what the tax yielded in the first two months of FY 2015, an astonishing outcome. Given that total General and Education Fund receipts are higher by $13.9 million over the first two months of FY 2015 means that the real estate transfer tax by itself is responsible for over half the increase in total revenues compared to one year ago. Whether this pace can be sustained remains an open question.